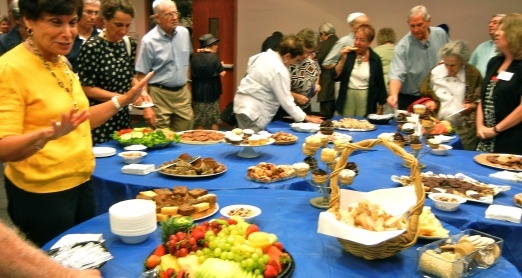 An Oneg Shabbat is a wonderful way to catch up with old friends and make new ones. Bet Aviv welcomes its congegants to usher in Shabbat at our Oneg following the Shabbat service. As we move into our Oneg room, our Shabbat Hosts distribute wine to our congregants. We recite the kiddush (blessing for the wine) and motzi (blessing for the bread) as we form a circle around the Oneg table. We pass around the challah after the motzi. Then we get a chance to welcome guests who have come to visit, greet long-time friends and say hello to members we would like to get to know better. Bet Aviv has hired a person with food management experience to purchase the food for our Onegs, plate and display the array, replenish food and drink as required during the Oneg, and to clean up afterwards. As part of bringing tikun olam to Shabbat, we package up leftover food and bring it to Grassroots, a local shelter that feeds the hungry. We encourage members to celebrate their mitzvahs with the congregation. If you have a special birthday, anniversary, or event (e.g., baby naming, retirement) in your life and would like to sponsor an Oneg, please contact our office. Click here to download the Oneg Sponsorship form. Click here for the blessing over the wine (Borei p’ri hagafen). Click here for the blessing over the bread (HaMotzi).